It’s already late, so I’ll just post up this week’s talk and chime in another day with some of my own thoughts. This was the first talk from the Saturday p.m. session of conference. 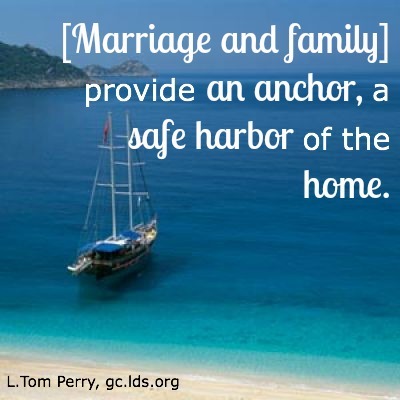 I LOVED Elder Perry’s talk. First, I am a HUGE advocate of the family, and raising many boys, I really appreciate the perspective of that boy who just (recently) left home. I was not raised in a home where I missed being there. But then I also did not have to sleep on the ground or use mosquito netting. I suppose if I had had those experiences I would have had more gratitude for the home my parents provided. I do know that my boys who have left, have similar feelings. As our oldest prepares to spend his first Christmas home in three years, he is constantly calling to express his hopes and dreams about what that two weeks will look like. He expresses desire for family traditions, certain foods, smells….things that mean holiday and home to him. I suppose we all have those longings and desires for those things that bring us peace and comfort and they are more prevalent when we do not have them. I wonder, if the veil were removed, if we would also have those longings and desires for the heavenly realm where we resided before mortality. Sometimes life is hard and a hug, even a mortal one, is a welcomed respite. Oh, and since I am new to this, do you also go through the Priesthood and RS sessions? Just wondering! I appreciated his 5 suggestions on ways to create a good family culture. Even though I am now doing most of this on my own, I am still trying to do the things he talks about–prayer, scripture study, FHE, work, family meals, etc. These things were a part of the home I grew up in and they helped to shape who I am.